Largehearted Boy: Book Notes - Thomas Pierce "Hall of Small Mammals"
Book Notes - Thomas Pierce "Hall of Small Mammals"
Previous contributors include Bret Easton Ellis, Kate Christensen, Kevin Brockmeier, George Pelecanos, Dana Spiotta, Amy Bloom, Aimee Bender, Jesmyn Ward, Heidi Julavits, Hari Kunzru, and many others. 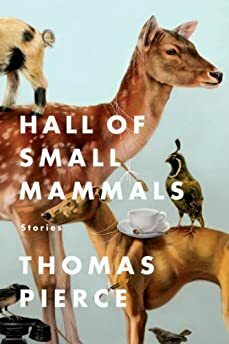 Thomas Pierce's Hall of Small Mammals is an impressive debut short fiction collection. "There isn't a weak story in Hall of Small Mammals, and Pierce is an endlessly incisive and engaging writer. It's a book full of wisdom and emotion, with stories that explore what it means to live and die in a world filled with invisible things." In a previous life I sometimes directed radio shows at NPR. When a show is on the air live, the director's job is to cue the stories, to help the host to hit the time posts, to watch the clock. Always the clock! Public radio shows operate according to very strict clocks. It's a stressful job that involves a lot of quick math. Whenever I was directing a show early the next morning, I'd sleep terribly. I'd dream about dead air and busted time posts and calculators that flashed the wrong numbers. Anyway, the job did have at least one perk: Directors get to pick all the music that plays between the stories and segments. I'd spend hours trying to find just the right piece of music to match a story's mood or to echo a line in a playful if predictable way. I really miss this part of the job, and so I'm grateful to have the chance to give the same treatment to my first book of short stories. This isn't necessarily the music I listened to as I was writing. This is the music I would pick if I was directing the book like a radio show (or film). Harry Nillson -- "Me and My Arrow"
Hilarity ensues when a lonely retired lady has to care for a cloned dwarf woolly mammoth that her charming but feckless son has dropped off at her house. Okay, maybe not hilarity. Loopy, goofy, googly-eyed--what better song to kick us off than one originally written for a strange animated film from the 1970s? Substitute the word ‘mammoth' for ‘arrow,' close your eyes and imagine the music over this: a montage in which a woman brushes a mammoth's long tangled hair, feeds it M&M's, rubs lotion on its dry patches, watches television with it on the couch at night. The Isley Brothers -- "Love the One You're With"
Walker is dating a theoretical physicist named Claire, who dreams every night that she's married to another man. Her dream husband isn't even so dreamy. He's not George Clooney. He is Dr. Alan Gass--opthamologist, Saturday golfer. Walker doesn't know what to make of this situation. They are on their way home in a cab one night when Claire falls asleep with her head against Walker's shoulder. Cue music. Is this Walker's song--or Claire's? I'll leave that to you. R.E.M. -- "What's the Frequency Kenneth?" I'm a huge R.E.M. fan. They are one of my favorite bands of all time. This is far from being my favorite R.E.M. song, but it is the one I associate most with my days in the Boy Scouts, the song we made our fathers listen to as they drove us up into the Blue Ridge mountains to live in the woods for two and three nights at a time. It feels appropriate therefore to use it here, as the soundtrack for a story about a father and son joining a cultish, bizarro version of the scouts called the Grasshoppers. St. Vincent -- "Laughing With a Mouth of Blood"
Does God look like Allen Ginsberg? What's a hallelujah bath? Did aliens create life on earth? A girl named Ellie feels spiritually adrift. Boyfriends, jobs--everything seems temporary. I imagine her listening to this song--which I think she'd like as much as I do--with the windows down in her car as she moves back home after a breakup. Just as she pulls into town, the chorus swells: All my old friends aren't so friendly. All my old haunts are now haunting me. Daniel Johnston -- "Devil Town"
Honestly I really can't think of a better song for a story about a mysterious and (possibly) evil deformed possum skull. A comedian named Felix fears he's soon to be iced out of his young son's life. Felix is a man who says the wrong thing, who wants to connect with the people he loves but doesn't know how to do that. In one scene he wanders into an empty hotel bar wishing for a drink. Rod Stewart is playing on the stereo. I don't specify the song in the story, but yeah it's probably this one. Johannes Brahms -- "Hungarian Dance No. 5"
One of the many, many characters in this story is a cellist who confesses to his wife that anytime he hears "Hungarian Dance No. 5," he has memories of a past life in which he's in love with a beautiful maid in a fancy ten-story hotel. Personally I've been obsessed with this song ever since I played it with my high school orchestra, and it was on repeat in my head as I was wrote this story. It's dramatic, fun, antic--like a hayride through a ballroom. The Beach Boys -- "Let the Wind Blow"
I'll set the scene: A hot-air balloon pilot named Fiona has taken up a single passenger, a middle-aged guy with a parakeet in a cage. He doesn't seem much interested in the Blue Ridge mountains below them, and so Fiona sips her coffee and appreciates the perspective. The basket creaks. The wind blows. The grass grows. Why is the middle-aged guy taking his parakeet from its cage? Lou Reed -- "Perfect Day"
Bert's brother has died overseas from a mysterious contagion, and his body will never be allowed to reenter the country. Bert can do little as his brother's body is shipped across the globe from one research lab to another. Cue music. One day Bert gets the chance to board a helicopter and fly over a ship that currently houses his brother. It's time to say goodbye. Helicopter blades chopping, they begin to circle the ship, and then the chorus posts and swells: Oh it's such a perfect day! I'm glad I spent it with you! Oh, such a perfect day. You just keep me hanging on. Jane Birkin -- "Orang Outang"
Yeah, it's a song about an orangutan, and yeah, I have some orangutans in the story. But for all its chirpiness and ice-creamy melody, I love this song and find it vaguely unsettling. Plus I'd really like to see this story--about a guy who takes his girlfriend's son to the zoo to see some endangered monkeys--transformed into a no-smiles French New Wave film. Welcome to the wiggly world of the early nineteenth century. Gigantic fossils have been unearthed on a farm in the small town of Golly. Not even Dr. Anders--the proto-paleontologist who has come to town to procure the bones for his scientific academy--knows what to make of them. This is the song that plays as he tries to arrange and fit together the fossils in a rickety barn. The Wizard of Oz -- "If I Only Had a Brain"
Chad & Jeremy -- "Yesterday's Gone"
A brother and sister are trapped in a stranger's pantry by some attack dogs. The brother has recently suffered a brain injury and feels like a different person. "If I Only Had a Brain" is the song stuck in his head when the story opens. "Yesterday's Gone" is the one stuck in mine as the story--and book--closes. Imagine the song isn't directed to an old lover but a long-gone version of yourself.